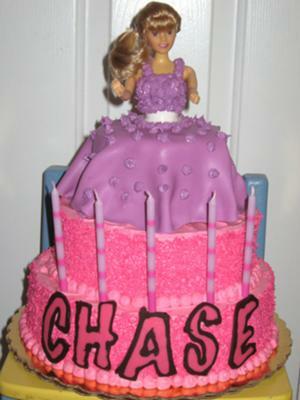 The actual cake for this Barbie birthday cake is a vanilla cake. Each tier is 3 layers. Starting from the bottom is a 10" cake, then an 8" cake and then under Barbie's dress is a 6" tier. All the layers were iced with vanilla buttercream colored with electric pink food coloring. I really wanted the cake to be bright. The sides of the two bottom tiers are covered with pink jimmies. The jimmies are great for decoration, but they also hide some of the flaws that are left behind after you apply the icing. The top tier is covered with fuschia colored fondant. I draped that on top of the 6" tier. I inserted the doll pick into the center of the tier. The bodice was made with royal icing. I used the smallest star tip I had to apply the icing. The white waist band was a strip of white fondant that I just wrapped around. Love that cinched waste look! The letters were made out of semisweet and white chocolate. Wonderful job! It looks GREAT!!! !